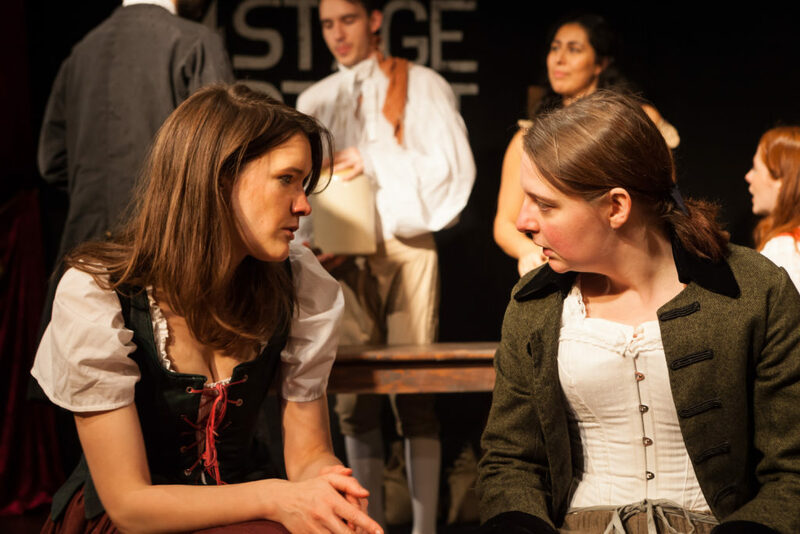 10 is an ambitious project for an hour long play; to distill the lives of ten women from history. Luckily, Lizzie Milton’s script lives up to the challenge well. 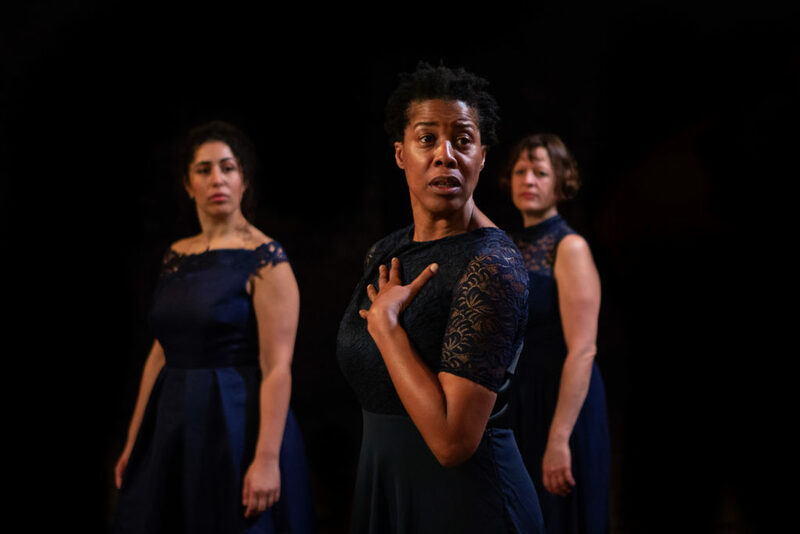 When the audience enter the five women, who will take on two roles each, are standing around the space, statuesque in long dark blue dresses. The beginning and the transitions are nicely done, with simple choreography and unified breath. Director Nastazja Somers has created a strong framework on which to base the strands of the women’s stories and the music, sound and lighting, by Nicola Chang and Rajiv Pattani, support and complement the action beautifully. The casting is largely race and age blind, and it works really well. Pamela Jikiemi took on the contrasting roles of Aethelflaed and Mary Prince. As Aethelflaed, the earliest recorded female ruler in Britain, she was impressive; portraying pride in achievement, and the shock of not being remembered. As Mary Prince, a woman who escaped slavery and terrible ill treatment to become only the second black woman to have her autobiography published, she was magnificent. Mary’s strength and anger, her suffering, and her pride shone through, and her sorrow when she thought of her husband was genuinely moving. Rebecca Crankshaw was Brenda Proctor and Ada Lovelace. Proctor played a central, but largely undocumented, role in the miner’s strike, leading twenty-three thousand women on a march from Staffordshire to London. This piece was the least successful, not really conveying Proctor’s strength. There was so much concentration on her warm offerings of tea and cake that her activism rather got lost. Crankshaw gave a strong performance as Ada Lovelace, although I found her declarations, such as ‘I’m bloody brilliant, aren’t I!” rather jarring. There was no sense of her as a woman of her time. Lydia Bakelmun played Princess Caraboo and Noor Inayat Khan, bringing warmth and charm to both roles. Princess Caraboo was a young woman from Devon who managed to convince people both in the UK and the USA that she was a princess from a faraway land. When her deception was discovered she settled in Bristol and sold leeches to the Infirmary. Bakelmun’s Caraboo was flirtatious and appealing, sure of her beauty and delightful. In the very different role of Noor Inayat Khan she gave us a portrayal of a brave and very human heroine. Khan was of Indian and American descent, and was in the Special Forces during WW11. She gave the audience a dilemma. Would you kill a nazi to save the lives of innocent people? Could you do it? Khan’s courage, arrest and execution, her final cry of ‘liberte’ were beautifully portrayed. Beth Eyre’s first role was the Welsh artist Gwen John. John was recognised for her portraits of women, although she was overshadowed by her more famous brother, Augustus. Eyre’s Gwen was full of self doubt, imbued with a sense of faith, yet anxious about an upcoming exhibition. Her second role was that of Joan Clarke, who worked at Bletchley Park decoding the Enigma machine. Remembered now for her brief engagement to Alan Turing, Clarke was a gifted mathematician who made an important contribution the the war effort. Eyre showed her as a careful, deep thinking woman, concerned to make a word where everyone would be equally valued and welcome. Don’t try to knock the wall down, create a way through – a door maybe, she said. Naomi Knox gave us Mary Seacole and Constance Markievicz, two very different women, both brought beautifully to life. Seacole was British-Jamaican woman who went to nurse in the Crimea, going there at her own expense. Knox showed her as a strong, woman, fulfilled by her work and her care for the patients. Then as a person lost, having to return home after doing so much. The warm strength of Mary Seacole was sharply contrasted by the harder strength of Constance Markievicz, a political revolutionary who fought for Ireland’s freedom from Britain. Knox was fierce, deadly determined, ready to shoot, but showing, too, Markievicz’s isolation in prison and her belief in a better world. The play’s ten women, some better known than others, each made their own unique contributions. As an audience, enjoying the performances, we also learned about these extraordinary people and their lives, without ever feeling that we were being taught.